1. Sup Moisés Describes What Is Needed to Rebuild the Autonomous School and Clinic in La Realidad – In this communiqué Subcomandante Moisés describes in detail the materials and equipment necessary to rebuild the autonomous school and clinic in La Realidad that the CIOAC-H members destroyed in the May 2 attack in which Compañero Galeano was murdered. The communiqué is entitled A meeting in La Realidad a few days ago. Instructions for sending donations can be found here. 2. 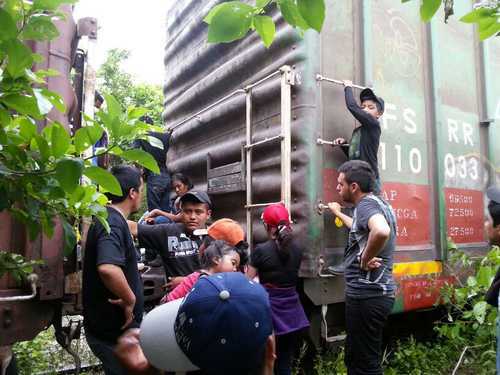 More CIOAC-H Attacks – Primero de Agosto, a pro-Zapatista Tojolabal community in the same region as La Realidad, denounced aggressions from the Independent Central of Agricultural Workers-Historic (CIOAC-H, its initials in Spanish) and another organization called the ASSI. The aggressions include provocations, threats, attempted murders, robbery and a land invasion. Those who murdered Compañero Galeano belonged to the CIOAC-H and the Zapatistas classified the organization as paramilitary. According to the denunciation, the paramilitary behavior continues. 4. US Ambassador Anthony Wayne Inspects Chiapas Border with Guatemala – For two days during the last week of June, the US Ambassador to Mexico, Anthony Wayne, flew over portions of the Chiapas border with Guatemala and met with commanders of the Mexican Army and Navy regarding security on that border. He also visited the large migrant detention center (capacity 2,500 per day) and learned that Mexico has detained and deported 10,505 minors in the past year. The ambassador’s visit dramatizes the importance this issue has taken on and the importance of Mexico’s southern border. 1. Jose Manuel Mireles, Self-Defense Leader, Arrested – In April, we reported that leaders of the various self-defense groups from 20 Michoacán municipalities signed an agreement with the federal commissioner for Michoacán, Alfredo Castillo, and other government officials to “demobilize” and register their weapons. The deadline set for the demobilization was May 10. Not all of the self-defense leaders supported this agreement. In other words, the federal government divided the leadership. So, some of the self-defense members have registered their weapons and joined the rural police; while others have not. One of the self-defense leaders that did not register his weapons or join the rural police is Doctor Jose Manuel Mireles. Instead, he criticized the government’s role in Michoacán. Soon after he led a group of armed autodefensas into the small town of La Mira, federal police and members of the Mexican Army and Navy arrested Mireles and 69 others (later reports say 82) accompanying him for carrying their unregistered weapons. 2. Guerrero’s Community Police Suffer Internal Division – On June 21, one community police agent died in a confrontation between the two opposing factions in a struggle for control of the San Luis Acatlán House of Justice. The Regional Coordinator of Community Authorities-Community Police (CRAC-PC, its initials in Spanish) suffered a serious internal division this year, which some attribute to the government’s interference in this autonomous project. Details here. 3. The FPDT in San Salvador Struggling to Defend its Land Again! – The People’s Front in Defense of Land (FPDT, its initials in Spanish) is once again facing the threat of losing some of its farmland to urban development and a new airport in Mexico City. On June 1, the ejido assembly approved a measure that would permit converting agricultural lands into private property, thus opening the door to a new Mexico City Airport and the Ciudad Futura (Future City) Project. The ejido Commissioner is a PRI member and the FPDT emphasized the “irregular and illegal” nature of the assembly and said it would take legal action as well as engage in social protests. The FPDT is remembered for the valiant defense of its land and marches with machetes raised from 2001 to 2002, after the federal government’s first effort to construct the new airport on Atenco’s land. 1. 52,000 Unaccompanied Migrant Minors – The tragedy of children attempting to migrate without a parent or other adult relative has overwhelmed US immigration facilities; and those are only the children that get caught! The Pew Research Institute reports the following percentages for the countries of origin of unaccompanied children apprehended between October 1, 2013 and May 31, 2014: 25 percent are Mexican, an equal percentage are Guatemalan, 29 percent are Honduran and 21 percent are Salvadoran. This is a dramatic increase of Central American children. The United States has agreements with Mexico for returning the Mexican minors promptly. That is not the case for the Central American minors. The US government must find housing for them while their immigration cases are processed. Many of the Mexican and Central American children are fleeing the violence of criminal gangs and drug traffickers, trying to reunite with parents that are working in the United States. Many have asylum claims. Immigration reform would grant relief to others, but the US government seems incapable of reforming that obsolete system.